We all know the contributions of the Filipino guerillas during the Second World War in the Philippines. They fought valiantly against the Japanese invaders and kept up this fight until their country was free. These veterans should be honored and remembered, but a lesser known fact about Filipino participation in World War II was that the United States raised two regiments of Filipino soldiers in the United States. The two units raised in the United States performed admirably in the Pacific and earned the praise of the press and public. Following the bombing of Pearl Harbor on 7 December 1941, Filipino Americans rushed to join their fellow Americans in defending the country. Ever since the establishment of the Philippines as a colony, Filipinos were allowed to immigrate to the United States as nationals. However, due fact that they were nationals and not citizens, they couldn’t volunteer nor could they sign up for the Selective Service, or the draft. By the thousands they appealed to the President to let them serve the country and on 3 January 1942, the President passed legislation that allowed the Filipinos to volunteer for the Armed Forces. Soon, thousands signed up with half of the male Filipino population in California signed up. 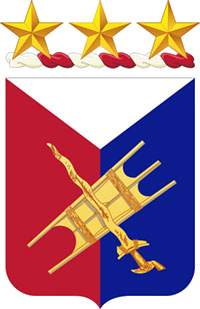 Constituted in March 1942 and activated in April at Camp San Luis Obispo, the 1st Filipino Infantry Battalion came into being with a headquarters company and four infantry companies. The commanding officer was Colonel Robert Offley, who spoke Tagalog thanks spending his youth in Mindoro where his father was the military governor. Soon, the Battalion’s numbers grew and grew, augmented by Philippine Army personnel who were in the United States at the time and also those who managed to escape the fall of the Philippines. In July 1942, the battalion was elevated to a regiment in Salinas, CA and a second regiment was activated at Ford Ord, CA in November 1942. Before going overseas, over 1,200 soldiers took part in a mass naturalization ceremony on 20 February 1943. They formed three battalions, a regimental headquarters company, an anti-tank company, a medical detachment, and a band. They also took the motto, “Laging Una,” which meant Always First in Tagalog. Although they proudly put on an American uniform to serve the United States, the Filipinos still faced discrimination in many places they served or were stationed. One sad aspect was that to marry someone not Filipino, they had to travel to New Mexico, which didn’t have anti-miscegenation laws like the rest of the United States. In Marysville, CA soldiers faced discrimination from local businesses until Colonel Offley set them straight. Yet despite this discrimination and prejudice, the Filipino Americans served with great honor and distinction in the Pacific. Deployed to New Guinea in April 1944, the Filipino Regiments arrived in Oro Bay where they assigned to the 31st Infantry Division and began to train for combat. Many of the Filipino soldiers were reassigned or volunteered for special duties, such as reconnaissance or intelligence gathering. Man joined the elite Alamo Scouts who specialized reconnaissance, infiltration, and intelligence gathering. Still more joined the Allied Intelligence Bureau and sent to the Philippines where they could blend into the civilian population. So many Filipino soldiers were assigned somewhere else that the 2nd Filipino Infantry became a battalion! The 1st Filipino Infantry was reassigned to the Americal Division in February 1945 and in May, it landed on Leyte to begin mopping up duties on Luzon, Samar, and the Visayan Islands including the Bataan Peninsula where so many of their fellow Filipinos died or became captives. The Center for Military History credits the regiment with campaign streamers for New Guinea, Leyte, and the Southern Philippines. They also received the Philippine Presidential Unit Citation for their service. After the war, the 1st Filipino Regiment and 2d Filipino Infantry Battalion (Separate) stayed in the Philippines where many Filipinos reunited with their families, met new friends, and many enjoyed Filipino culture for the first time where they only once had a distant relationship in the United States. Under the War Brides Act, they were allowed to bring new wives to the United States and many decided to stay in the Philippines. For those who returned to the United States, the regiment was sent to Camp Stoneman in Pittsburgh, CA where it was deactivated on 10 April 1946. The legacy of the Filipino Infantry Regiments was kept alive by its veterans in memorials like the marker in Salinas, CA, raised in 1984, and the documentaries Unsung Heroes and An Untold Triumph. On 25 October 2017, Congress will honor the Filipino Veterans with the Congressional Gold Medal or their service. The Filipino guerillas and the soldiers of the Filipino Infantry Regiments will be honored and a large disservice finally corrected.